Truth might have a taste. Would we know it when we tasted it? At L’Ulu a year or two ago, Chef Ed Kenney of Town Restaurant handed me a little plate on which was half of a baby turnip with top attached, glazed with a slightly sweet clear sauce and sprinkled with a few crunchy popped grains. 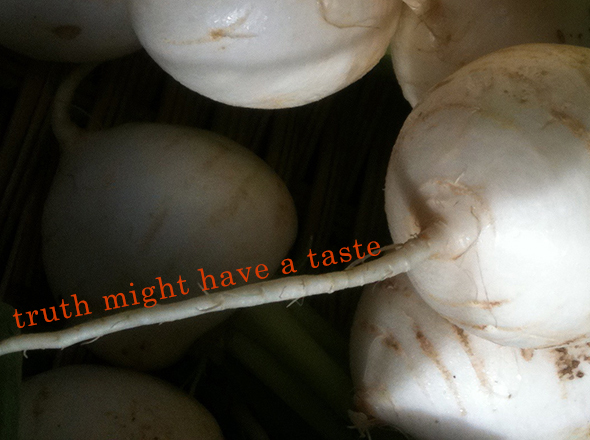 It made me think again about turnips. I had no idea they could be so lyrical. Like a fine green tea with all those scents and flavors of grasses and flowers, of crushed leaf and ground mineral, but more homely, like a turnip is, even when a baby turnip. It seems to me now that Ed Kenney was truthful with that turnip. Which was a risky thing to do, because, of course, the turnip was very much outgunned and over-shadowed by the flashy, dazzle-y flavors of the usual sort of luxurious concoctions at these culinary grazing events. You know, shrimp and saffron, champagne and mangoes, beef and lobster. But the turnip was there giving testament. It was clear that Ed Kenny knew these turnips. That they were not just ingredients in a list at the beginning of a recipe; that he had seen and even, perhaps, tasted the soil they grew in, had seen them grow from seed to seedling, to harvest; that he understood their cultivation. Cultivation, what a miracle it is: the long, long partnership between human and turnip for centuries and millennia, generation upon generation; our relationship to the wild ancestor of the turnip that we met and knew long ago as wild beings ourselves – hunters and gatherers – and brought along with us, brought into our fold, as we became farmers and then scientists, constructed our cities, and then our civilizations. Without turnips and wheat, rice and taro, soy and corn, eggplant and cucumber, we would not be what we are – artists, scientists, businesspeople, teachers – and they would not be what they are without us, and our shaping, our planting and harvesting, measuring and selecting. Our very minds exist within an unacknowledged reciprocity. The civilization that we enact by our highly specialized jobs and technologies cannot exist without the simple turnip. How do we do justice to the turnip? Perhaps, simply to remember what it is and what we are, not to forget our long journey together; to taste the reality – bitter, earthy, sweet – of the turnip and remember. Hi Michelle, what a gift this essay is! Have you read Tom Robbins Jitterbug Perfume? He, well Alobar and the bandaloops, elevate the beet in the same epic fashion you have done with turnip. It’s one of my all time fav books, I think I’ll read it again to revel in the smell of creative expression. Looking forward to seeing you soon! PS thank you Lisa and Dan for keeping this space for so much awesomeness.